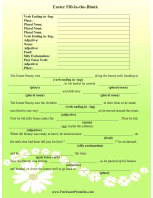 Children who left a carrot for the Easter Bunny will love this printable letter of thanks from the rabbit himself. Chomp, chomp, chomp. Oh, excuse me. Happy Easter! I was just enjoying that delicious carrot you left me. Thanks so much! 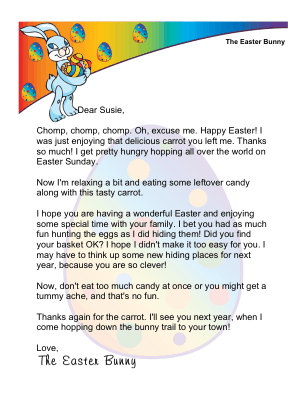 I get pretty hungry hopping all over the world on Easter Sunday. Now I'm relaxing a bit and eating some leftover candy along with this tasty carrot. I hope you are having a wonderful Easter and enjoying some special time with your family. 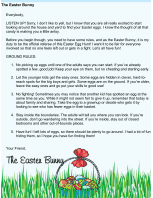 I bet you had as much fun hunting the eggs as I did hiding them! Did you find your basket OK? I hope I didn't make it too easy for you. I may have to think up some new hiding places for next year, because you are so clever! Now, don't eat too much candy at once or you might get a tummy ache, and that's no fun. Thanks again for the carrot. I'll see you next year, when I come hopping down the bunny trail to your town!